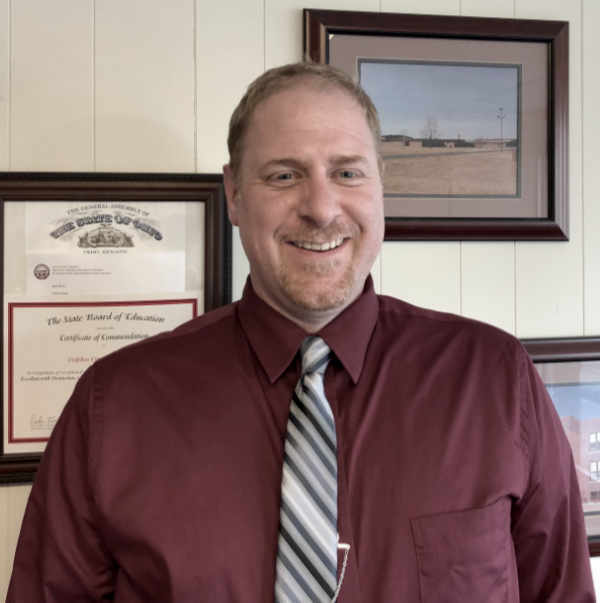 DELPHOS — 2000 Ottawa-Glandorf graduate Brian Fruchey is the new Jefferson Middle School principal. The Delphos City School Board gave Fruchey the official nod Monday evening during a short meeting. Fruchey earned his bachelor and master’s degrees from Bowling Green State University. He has worked at Leipsic, Patrick Henry (9 years) and is in his second year as assistant principal at Lima City Schools’ Heritage Elementary. Fruchey added that he was looking forward to getting to know everyone in Delphos. Fruchey received a two-year contract. He will start at the middle school on Aug. 1. Current Jefferson Middle School Principal Doug Westrick will take over the reins as superintendent on July 1. Westrick said Fruchey rose to the top in the interview process. “He has the qualities we were looking for,” Westrick said. The board also approved a 10-year, 60-percent tax abatement for K&M Tire. “We support the tax abatement and we hope they keep growing,” board member Andy North said. North also gave an update on what the board has learned about the new school funding plan. This is the fourth change in the school funding model in 25 years. According to State Rep. Bob Cupp, who chairs the Finance Subcommittee on Primary and Secondary Education with Rep. John Patterson (D), all changes will be phased in to the governor’s budgets. Interim Superintendent Faith Cummins reported the check list for the tasks that need done before Landeck Elementary students transition into Franklin Elementary and Jefferson Middle School is getting shorter. The board also approved purchasing a multi-purpose vehicle with a Chevrolet chassis from Cardinal Bus Service through the Southwestern Ohio EPC-2018-19 Bus Bid Program to replace the oldest handicap bus. The cost of the vehicle is $40,272. Also approved was a mini-van to replace a Chevrolet Uplands used to transport students to Lima/Bath. Donations were accepted, including R$2,500 from Jefferson Athletic Boosters for the completion of the weight room improvement project; $9,428 from the Delphos Eagles for special projects and programs at each building; and an anonymous $3,500 for the renewal of the Accumax program used in hiring. The board approved three resignations. Sarah Prine resigned as junior high cheer coach effective immediately; Sara Ainsworth as Spanish teacher, effective at the end of the current school year; and Alan Unterbrink as St. John’s High School guidance counselor effective at the end of the school year. • a Memorandum of Understanding with the Ohio Department of Transportation to develop a safe travel plan through the Safe Routes to School Program. The next meeting will begin at 6 p.m. on May 13.